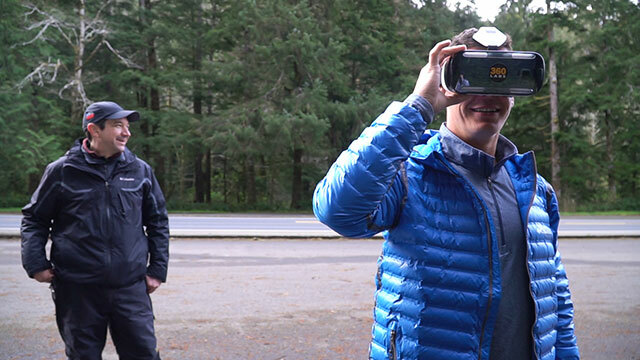 On very short notice, Dell EMC came to us with a need to produce a 360 video with Columbia Sportswear’s Director of Toughness, Mark Chase. The goal was to illustrate how Columbia uses Dell’s technology to design products and show this off in a 360 VR experience for the Dell EMC World Conference in early May of 2017. The original ask was to create a rock climbing experience at Smith Rock State Park, but we were unable to obtain a permit due to April being a peak season for climbing at the park. No permits would be awarded to any production companies until June. There’s no way this could work in time for Dell’s conference. Fortunately, we had a prior connection with Expedition Old Growth, an outfitter who provides guided tree climbs. 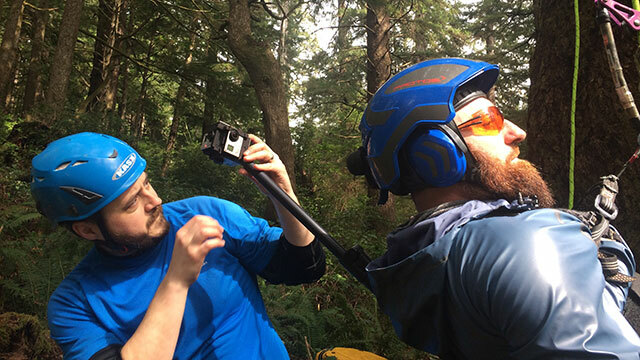 We pitched the idea of moving the climbing experience into the forest, on the Oregon coast at Oswald West State Park, to climb a 200 foot sitka spruce tree. Dell loved the idea. With limited time and only about 10 days to plan, 360 Labs worked closely with Expedition Old Growth to obtain permits, scouted and found a great location. 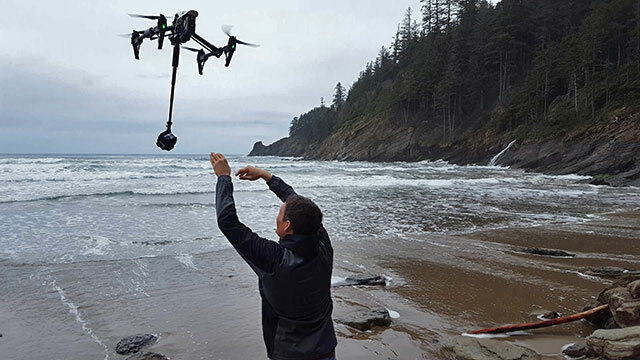 We also arranged to work with a professional drone pilot from Skyris, a local Portland company, to fly our 360 cameras over the ocean towards the old growth forest. The production was 2 days in total, with the first day being split between filming at Columbia’s headquarters with Dell’s 3D scanner while the rest of our team went out to Oswald West to begin scouting the location for rigging cameras. Day 2 was all out at Oswald. In the tree, we rigged several custom 360 cameras to branches at the top, mid point, and lower points on the tree. Modified GoPros with aftermarket fisheye lenses were used here because they could risk getting damaged or wet, could easily be started by remote, and would be easy to stitch in cramped quarters. We also rigged cameras to the climbers with a SailVideoSystem third-person mount to give the viewer the thrill of the climb from POV. Skyris gave us a bird’s eye view of the tree tops while flying our Freedom 360 with 6 Hero4 cameras. This rig allows us to shoot 60fps and still yield a 6k stitch, while using ND filters to cut back the risk of rolling shutter jiggle. For post, Dell EMC had a very talented in-house producer who had worked with 360 video before, so the plan would be for Dell to do the editing. We provided all of the rough stitches from every camera within a few days. After creating a rough edit that was approved by Dell internally and ready for picture lock, 360 Labs handled finish including fine stitches, rig removal with Mocha VR and stabilization. With so many people working and so many moving parts, we were very pleased with the results. Everyone involved did an exceptional job! Despite having to spend a few late nights, everything was ready in time for the conference. 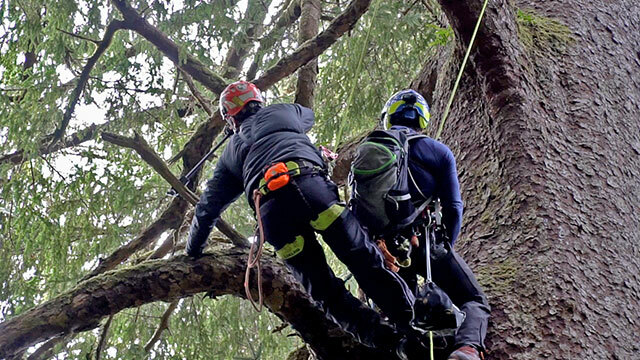 Ever wanted to climb a 200' tree and see spectacular views? Based in the Pacific Northwest, Expedition Old Growth provides tours of the region’s beautiful forests while assisting adventure-seekers with their guided ascent to the upper most canopies of the majestically ancient trees. Along the way, we create a greater appreciation for the living habitat and unique flora thriving at the forest floor and up into the tree-tops.